Facebook manipulated 689,003 users’ emotions for data collection and analysis in 2014, and now they have been approved for patents to take their emotional experiments a step further. 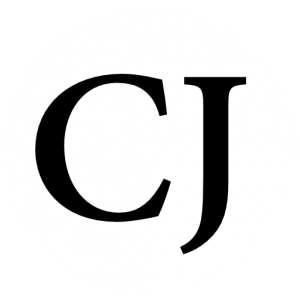 CB Insights recently released a report that included three of the social medias emotion-based patents. The patents reveal Facebook’s invasive plans to capture and respond to users emotional reactions, gauging what content people find the most interesting. The tech giant plans to promote the features to the consumer as a way to better communicate themselves and their emotions, and hey, if a person isn’t in touch with their emotions, don’t worry! 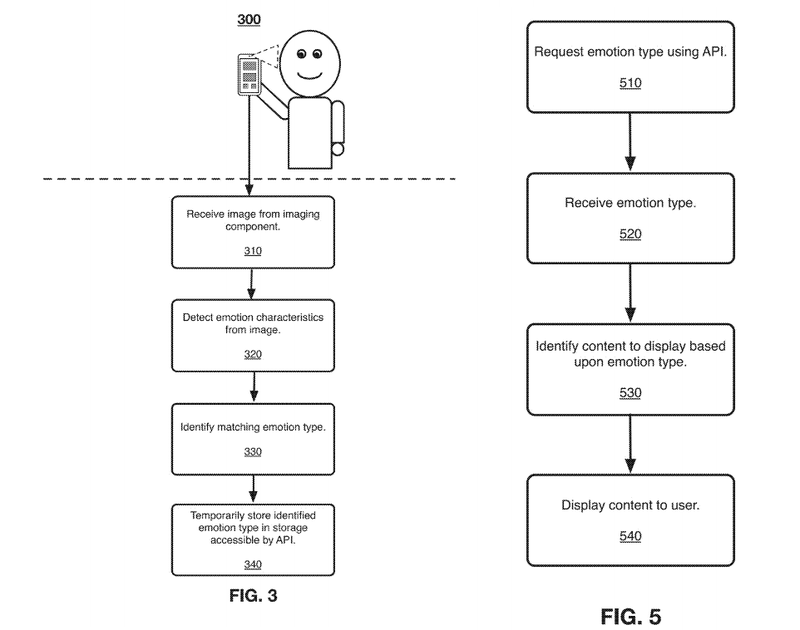 With these new patents, Facebook can read your facial expression and tell you what you’re feeling, then allowing you to share that emotion through text or emojis. 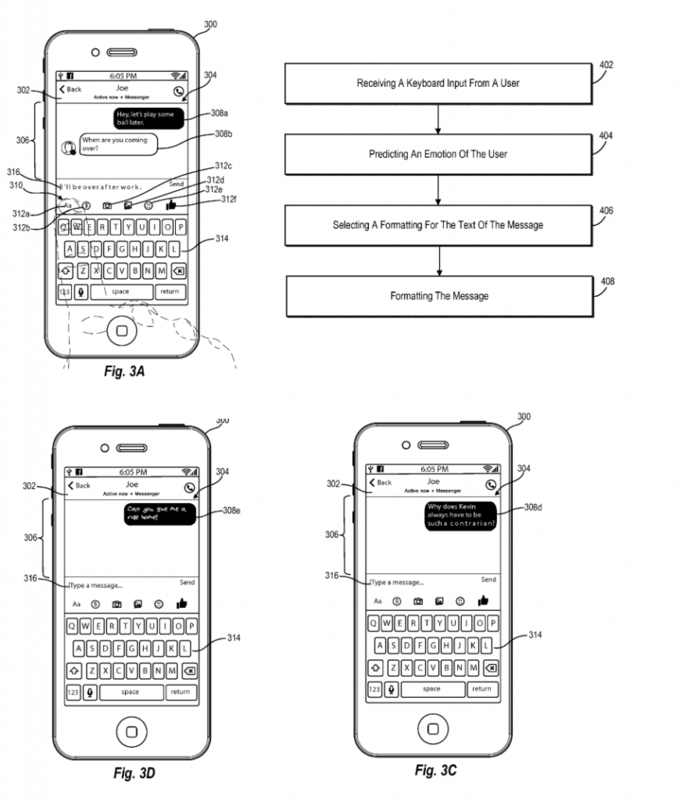 This patent describes a more streamlined process for sending messages with emojis. The system would capture real-time image data of a face (such as through a selfie) and analyze the facial features to determine the user’s emotion, and map it to the emoji that would be the best fit. For example, it could serve up a smiling emoji in response to a photo of someone smiling. The user can then add the emoji to a post or message. 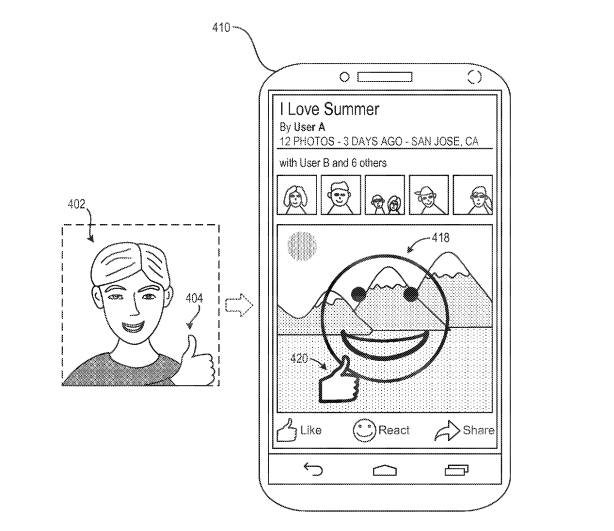 The patent mentions several additional features, such as the ability to modify the emoji based on more detailed analysis of the user’s face, and the ability to capture gestures made by the user and add those to the emoji (such as the thumbs up in the image above). By reducing users’ facial expressions to emojis from a pre-set list, Facebook could potentially analyze users’ emotions more easily. Facebook could gain clearer insight into feelings and reactions, while also adding a new interactive feature. The following patent would implement a feature where Facebook could measure the speed and pressure that a person presses the keys while texting to detect their emotion. They plan to market it as a way to share your feelings as the feature would translate them into text for you. The most disturbing of the patents released is “Techniques for emotion detection and content delivery” because it would allow Facebook to watch their users through their smartphone camera or webcam. This creepy and invasive addition to Facebook would take photos of the user to identify their emotion, then store the data. Facebook can then use the data to analyze what their content makes the user feel, which is vital information, especially for those with bad intentions. This patent proposes capturing images of the user through smartphone or laptop cameras, even when the user is not actively using the camera. By visually tracking a user’s facial expression, Facebook aims to monitor the user’s emotional reactions to different types of content. To monitor the user, Facebook proposes using “passive imaging data,” or visual data captured automatically through a laptop or phone’s front-facing camera. The user often faces this camera without thinking about it, while using the phone or laptop normally, and Facebook hopes to start leveraging this imaging data. Once the system captures the images, an API component would identify the user’s emotion and store the data. Then, Facebook could a) determine which emotions a piece of content elicits, which could be useful for Facebook as well as the content producers, and b) deliver content to the user based on the displayed emotion, which could help Facebook keep users more engaged. This gives Facebook and their algorithms full permission and access to view your emotional reaction to any given post. Through that monitoring, they claim that they will send you more relevant posts when in the past they have tried to manipulate the emotions to see how posts effected people. This is an elitists dream because, through this data collection, they can view trends, allowing them to predict better how future events might impact people. 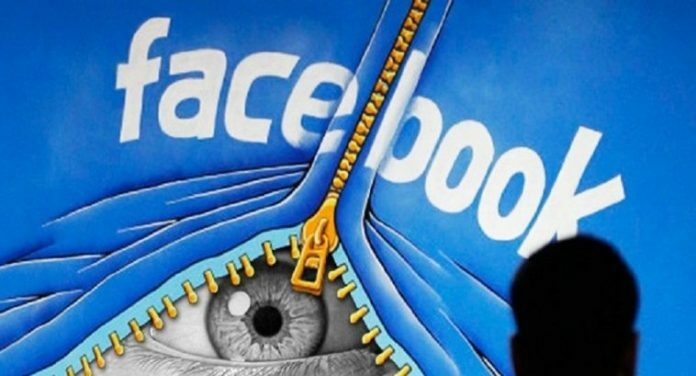 The agenda driving Facebook forward becomes more and more apparent, the social media giant wants to use their website and technology to influence society. The more they know about the user, the more they know how to pull strings and get a person to feel the way they want them to feel. By moving the social world from reality to a website, Facebook has more power than ever to influence emotions and collect mass amounts of data.